URBANA, Ill. – The U.S. Department of Energy (DOE) on Sunday awarded the University of Illinois a $10.6 million, five-year grant to transform two of the most productive crops in America into sustainable sources of biodiesel and biojet fuel. The new research project, Renewable Oil Generated with Ultra-productive Energycane—or ROGUE—kicked off on Feb. 25 with a team meeting held in conjunction with the 2018 Genomic Sciences Program Annual Principal Investigator Meeting in Tysons, Virginia. ROGUE will engineer energycane, a bioenergy crop derived from sugarcane, and Miscanthus to produce the oil that is used to create biodiesel and biojet fuel. The work is guided by computer models, which project that these crops can achieve 20 percent oil content in the plant—a dramatic increase from natural levels of less than a tenth of one percent. “If fully successful, these crops could produce as much as 15 times more biodiesel per unit of land compared to soybeans, a food crop that currently produces half of our nation’s biodiesel,” said Long, who leads the project’s efforts at the Carl R. Woese Institute for Genomic Biology. Previous work, funded by the DOE Advanced Research Projects Agency-Energy (ARPA-E), achieved 8 percent oil accumulation, and now ROGUE will further increase oil production and target oil accumulation in the stem where it can be accessed more easily with ROGUE’s patented extraction technologies. “Redirecting these plants to produce oil rather than sugar will enable us to make full use of these productive crops for biodiesel and biojet fuel production,” Li-Qing Chen, an assistant professor of plant biology at Illinois. ROGUE will also improve the efficiency with which these crops can turn the sun’s energy into plant energy to fuel their biological oil production. Improving these crops’ photosynthetic efficiency will ensure that the production of energy-dense oil will not lower yields or suppress plant defenses. Improving photosynthetic efficiency will also help the plant conserve limited resources such as water and nitrogen, particularly under stress. ROGUE will translate its bioenergy and sustainability discoveries into energycane and Miscanthus using synthetic biology, which applies engineering principles to optimize and speed up the design of biological systems. The project will also develop energycane to be more cold-tolerant to expand its growing region and extend its growing season. 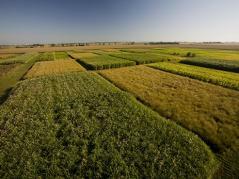 ROGUE will ensure the efficacy of its crop technologies through techno-economic analyses and replicated field trials. Energycane will be evaluated at Florida and Mississippi, and Miscanthus will be tested at Illinois. In tandem, the project will continue to perfect and evaluate its patented method to separate oil from biomass and its processing technologies. “According to our models, ROGUE crops will be much more productive and profitable per acre than corn or soybeans,” said Vijay Singh, director of the Integrated Bioprocessing Research Laboratory, who will lead the project’s techno-economic analyses and processing technologies. ROGUE is a collaboration amongst researchers from Illinois as well as Brookhaven National Lab, University of Florida, and Mississippi State University, with support from the DOE Office of Science (Office of Biological and Environmental Research).